Hello everyone! Queen of Katwe has been a passion project and a labor of love for so many involved, and I am continuously, endlessly proud to be involved in some small way in telling this powerful true story of this remarkable girl from Uganda. I ran into a friend in Kenya recently who was very excited about the movie and couldn’t wait to see it. She asked me when it would be coming out in the cinemas, but before I could respond she added, “Don’t worry, I’ll wait and buy a bootleg DVD on the streets.” I was surprised that she would say that so freely, but I quickly realized that she meant it as a demonstration of her support. But what she was planning to do actually sends the opposite message of what she intended. The truth is, the best way to support films that feature people of color who are front and center of their own narratives is to purchase those cinema tickets. This way the studios see that our stories are valuable and profitable. If we want to see more African films, more films about girls and women, if we want to see more films that reflect the diverse world we live in, we need to financially support those films that are being made for us and by us. I grew up watching bootleg copies of movies, too. There was no other way to see the films I badly wanted to watch. But, with Queen of Katwe, they are playing the movie in theaters all around the world. I’ve included the names of all African theaters showing the film below. 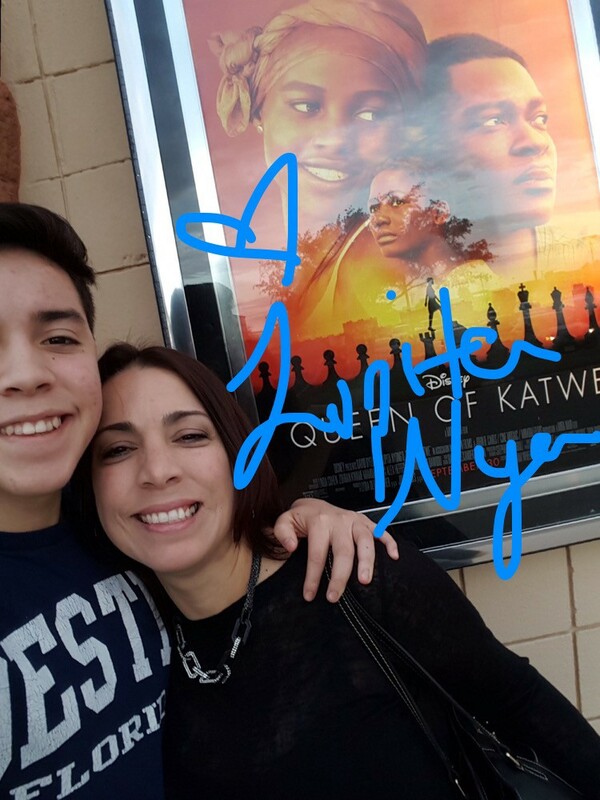 If you’re in the U.S., click here to find a theater playing Queen of Katwe near you. As a thank you for those who see Queen of Katwe in theaters, I’m inviting you to share photos of yourselves at the cinema with #MakeYourMove on social media. If you share these on Twitter, I may digitally autograph your photo and send it back to you as a token of my appreciation! I’ll be looking out for your photos and the winners’ photos will be posted on my Twitter page, which is twitter.com/lupita_nyongo. Example of a digitally autographed photo from me! Thank you in advance for your support. If we want to see more of ourselves on screen, let’s show the world that our stories are worth it! And oh, this is an independent message from a woman determined to make more opportunities for people of color in the entertainment industry!